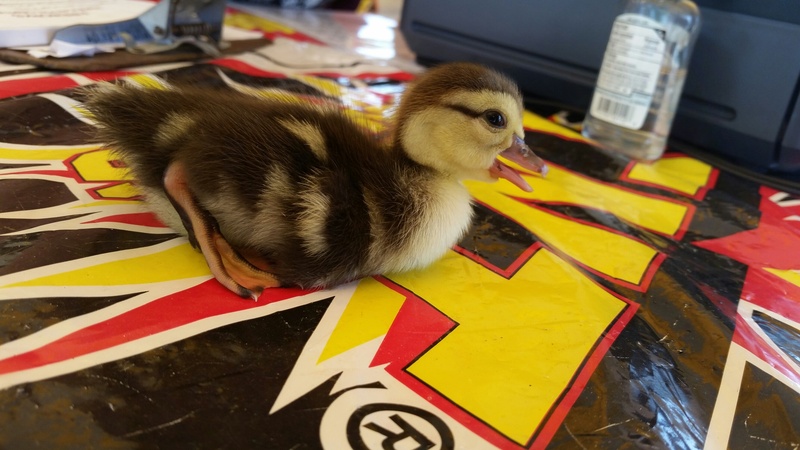 Injured duckling saved. Photo courtesy of Chrissy D.
Ocala, Florida — A local fireworks stand, which gives back to the community, gave back in a different way Friday afternoon. As a mother duck and her ducklings were attempting to waddle across Highway 200, in what appeared to be an attempt to get to the small pond behind Wells Fargo Bank, they were nearly hit by traffic. Realizing that drivers were not going to stop, Amy L. and Bob P., volunteers with Extensions Dance Studio who are raising money for “Just Entertainment, Inc., ” a non-profit corporation that raises money to help children in the Arts, and a customer jumped into action. Bob and the customer stopped traffic in both directions, while Amy helped the family of ducks across the street using the crosswalk. 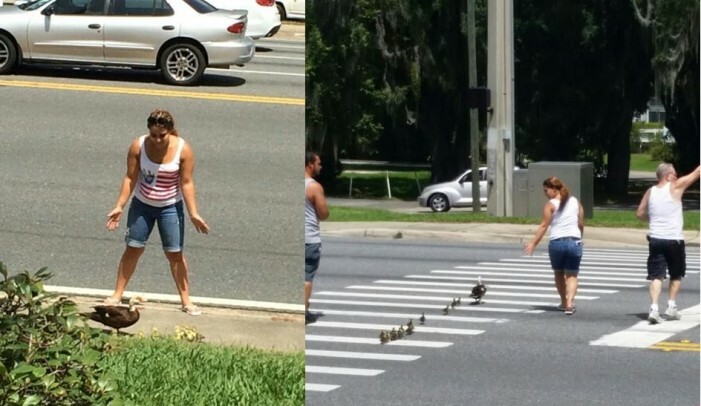 First photo courtesy of Becky G. : Amy blocking ducks from waddling into traffic. Second photo courtesy of Chrissy D. : Customer [far left], Amy [center], and Bob. Sadly, one of the ducklings was injured and could not keep up with its family, so, the mother duck left the baby duckling behind. But do not fret, the brother of an Extensions Dance Studio volunteer has rescued the duckling. He said he has property where he has raised other ducks. He said that the injured duckling will be taken into his home and nursed back to health. For the time being, the fireworks stand has a new mascot, which volunteers have named Stanley if it’s a boy and Stanlea if it’s a girl. You can view the locations of these fireworks stands that give back to the community here.